Are you looking for the right words to put into the Christmas message you send to your friends? Don’t stress your mind any longer, for you have navigated to a place filled to the brim with scores of beautiful Christmas wishes for friends. 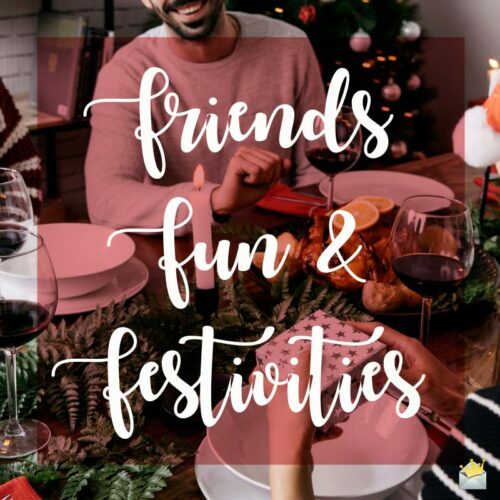 Use any of the following wishes of merriment to remind your pals of how much you care while making this Xmas one to remember. I wish you a Christmas in the presence of all of your precious loved ones. Happy holidays. Merry Christmas to my best bud in the whole world. Hope you have a great holiday. I wish you a Christmas with the warm cheer of multiple bottles of booze. Enjoy yourself nothing but glorious days. May you enjoy this Christmas as though you were a little child all over again. Happy holidays. I hope you love me enough that this won’t be one of those Christmas cards that just gets thrown in the trash, LOL. Happy holidays. One of my favorite Christmas memories is the one we spent together some years ago. Hoping you have the type of Christmas that reminds you of the true meaning of the holiday. May your family come together this Christmas and celebrate the holiday in a spirit of joy and unity as opposed to any type of strife. Merry Christmas. This Yuletide, may your children bring nothing but smiles to your face and remind you why you even bothered to have them in the first place! Merry Christmas. 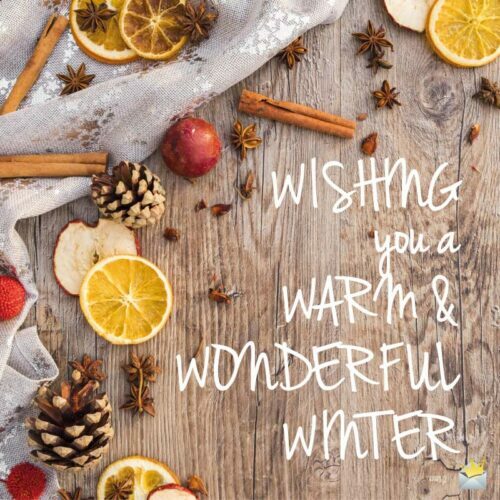 Wishing you a warm and wonderful winter. May your holiday thoughts be filled with nothing but the smiles of this past year and joys that are forthcoming in the next one. Merry Christmas. If you feel left out this Christmas, you are more than welcome, indeed even obligated, to stop by my place to enjoy the holiday. 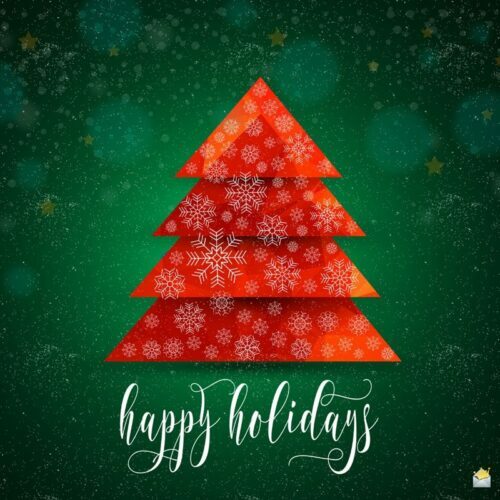 Wishing you nothing but true happiness this holiday season. I know your Christmas this year is going to be a gloriously joyful one because you are a wonderful person. Merry Christmas. Wishing you a beautiful Christmas that is heavy on the emotions but light on the pockets! Happy holidays. Whether alone, with family or with the homeys, I hope God will bless you with a truly merry Christmas. Merry Christmas, buddy. May this festive season give you the opportunity to enjoy the things you love the most in life. I would just skip this holiday altogether if I didn’t know it was so important to you. Merry Christmas. I can’t wait to see you this Christmas, the only time I have to spend with my real friends. I hope that the franticness of this holiday season is surpassed by the joy you will experience as a result. Merry Christmas. Christmas is definitely my favorite time of the year because it’s the only time of the year that I get to spend an entire week with you, my best friend! Merry Christmas. May you have a colorful Christmas full of bright lights, hot drinks and warm loved ones. May this Christmas contain every element you deem necessary to have a merry one. Happy holidays. May you have a wonderful Christmas, and may you be sober enough to remember it for years to come. Happy holidays! Hoping you enjoy a Christmas with the carefreeness of someone who is not afraid of interest rates! Merry Christmas! Please accept this gift with much love from your one-and-only best friend. Happy holidays. Christmas is a time which makes me think of family, which of course means you are one of the first persons to come to my mind. Merry Christmas. I have set aside a big budget just for us to chill this holiday season. This Christmas will definitely be merry like no other! May you have a wonderful Christmas, with your break from work feeling twice as long as it actually is. Happy holidays. May no Grinch, foreign or domestic, be able to spoil your holiday. Wishing you a Christmas where everyone is happy and grievances are at a minimal. Cheers! Here’s to another Christmas together. I really do not need anything this Christmas except for you to come over. Happy holidays, dear friend. May you enjoy that type of Christmas that will have your children still trying to emulate it 20 years from now. Happy holidays. As we grow older, Christmas becomes less about material items and more about spending time with the special people in our lives. However, that doesn’t mean I’m not expecting a gift from you. Merry Christmas! And don’t forget my gift. The beauty of Christmas is that it is the only festive occasion of the year where we can still get away with acting like silly little children. Happy holidays! May your Christmas be filled with the chaotic joy of so many loved ones spreading cheer. Happy holidays, dear friend. The best gift life has to offer isn’t material but rather a friend who is closer to you than even a sibling. I’m lucky to have such a priceless gift in you, my dear. Merry Christmas, and I’m very much looking forward to seeing you soon! I hope this year, I am able to bring the same level of cheer into your holiday as you have always done for mine. Merry Christmas. A hug and kiss from you this Christmas is all I need to get over the coldness of the season. Happy holidays! Can’t wait to see you. This beautiful Yuletide, may you get a well-deserved vacation from any and everything that worries your mind, body or spirit. Simply put, may you blessed with nothing but a truly peaceful and joyful Christmas. May your home be the center of happiness this Christmas. Christmas without you, would be like having this dead tree in my house with no ornaments. Wishing you a fabulous Christmas filled with every single thing that puts a smile on your face. My Christmas hero is you, the only person with whom I experience the joy of a nonobligatory, mutual love. Happy holidays. 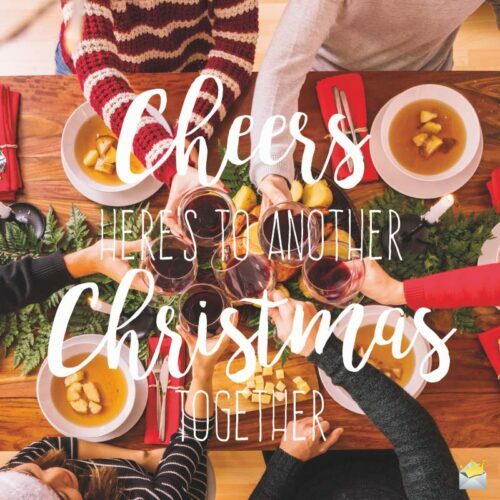 Another Christmas together has given us another cause to party – extra hard! Happy holidays, dear friend. If they ever did a Christmas movie about my life it would be called ‘Eggnog Is Thicker Than Blood’. Happy Christmas, dear friend! May your Christmas be filled with the joyful noise of sweet Christmas carols – or I guess in your case it would be loud Tupac tracks. Happy holidays! I hope this Christmas proves to be a classic one amongst all those you have experienced so far. Merry Christmas.